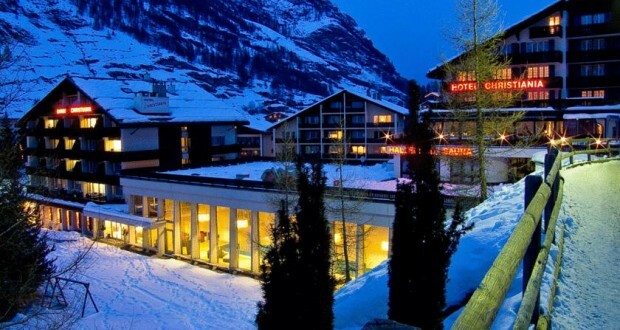 The Christiania Hotels & Spa is next to Zermatt’s underground funicular to the Sunnegga Ski Area, where you can reach all the ski resorts in the area. Many rooms offer panoramic views of the Matterhorn, and free Wi-Fi is available throughout the entire property. The spa area at the Christiania includes a Finnish sauna, a bio sauna, a steam bath, an ice cave, and a 82-foot (25-meter) long pool. It also offers panoramic views of the Matterhorn. In summer, there is a tennis court and miniature golf available free of charge. A rich breakfast buffet is served every morning. In the evening, guests can enjoy a 4-course dinner. Between 8 am and 8 pm, guests can take advantage of the free shuttle service to and from the Zermatt train station.